Ken Fletcher is the Ohio director of advocacy for the organization. He says the state got an F on the smoking age, which the report says should be raised from 18 to 21. It also flunked the state on the per-pack taxes on tobacco products and the amount of money dedicated to prevention efforts. We’re taking in $1.3 billion a year in money from the tobacco industry from taxes and tobacco settlement money. So the money is there. We’re just choosing not to put it toward tobacco cessation which is a big mistake because you look at how much is it costing Ohio. It's costing us $5.6 billion a year in healthcare costs that are entirely due to people smoking -- $5.6 billion. 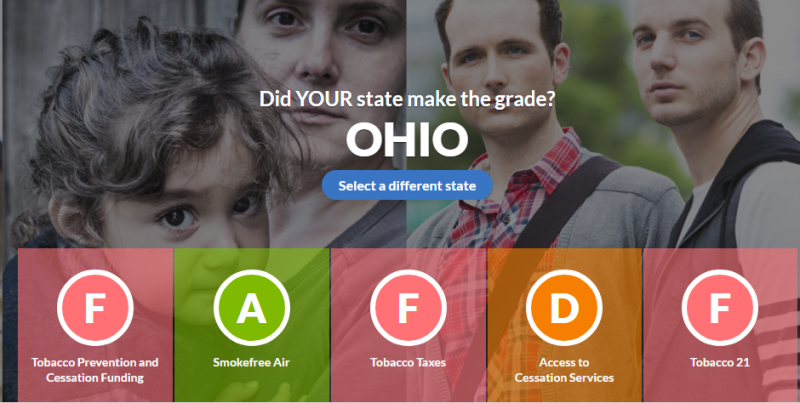 Ohio’s only A came in the category of smoke-free air because of its restrictions on public smoking passed by voters.